The gold season autumn is coming. Inspired by the warm temperature and romantic landscape, many couples would like hold a romantic wedding in this harvest time. Today, we will focus on the bridesmaid dress colors that are suitable in the autumn-themed weddings. Brown is the color of wood and drying leaves, which can match perfectly with the theme of the autumn. So, brown bridesmaid dress is absolutely one of the top choices in autumn wedding. Deep brown tone can create a classy and formal look, while rust brown tone adds a rustic touch. 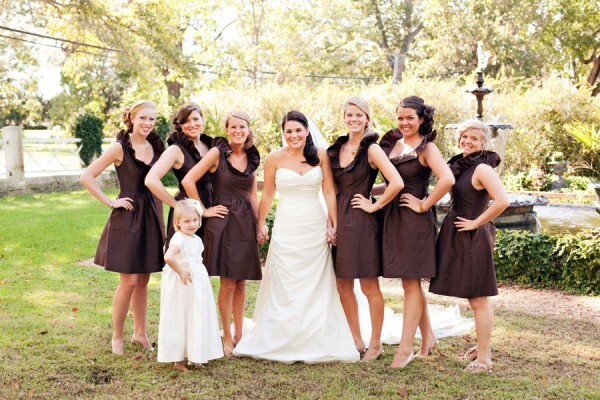 The rich tones of brown can satisfy every bridesmaid, and look good on almost any skin tone. Red in some countries, like China, is a traditional color for wedding. So, it is absolutely suitable for an autumn wedding. The color could coordinate well with the maple leaves, which perfectly reflects the autumn theme. Wine red or maroon red can add a romantic, sophisticated touch to the bridesmaid dresses. Bright red may create a Valentine’s or Christmas look. 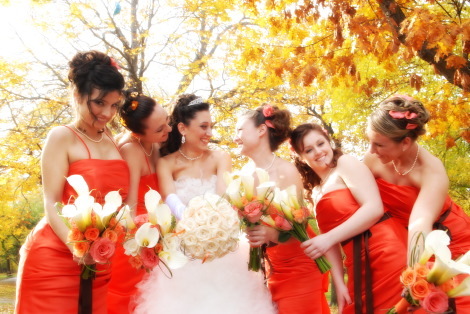 The different hues of red make the bridesmaid dresses decent in different styles of autumn weddings. The orange color is quite approximate to the colors of the falling leaves in autumn. Therefore, it can incorporate a lively color of the season into your wedding. A row of orange bridesmaid dresses would make your guests feel the romance of the autumn.